Report: Some groups blame bad economy on "a cabal of Jewish financial elites"
(CNN) -- Right-wing extremist groups may be using the recession and the election of the nation's first African-American president to recruit members, a Department of Homeland Security report contends. The Department of Homeland Security says membership in extremist groups like this may be increasing. Though the nine-page report said it has "no specific information that domestic right-wing terrorists are currently planning acts of violence," it said real-estate foreclosures, unemployment and tight credit "could create a fertile recruiting environment for right-wing extremists and even result in confrontations between such groups and government authorities similar to those in the past." 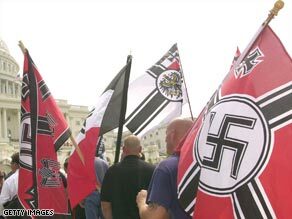 The report, prepared in coordination with the FBI and published April 7, was distributed to federal, state and local law enforcement officials under the title "Right-wing Extremism: Current Economic and Political Climate Fueling Resurgence in Radicalization and Recruitment." It cites proposed restrictions on weapons as likely to increase membership in extremist groups and expresses concern the groups might try to recruit veterans. The report also cites concern about anti-Semitism, saying that some groups are blaming the loss of U.S. jobs and home foreclosures on "a deliberate conspiracy conducted by a cabal of Jewish 'financial elites' " in an attempt to recruit members. The election of President Obama is cited as a key recruitment tool. "Many right-wing extremists are antagonistic toward the new presidential administration and its perceived stance on a range of issues, including immigration and citizenship, the expansion of social programs to minorities, and restrictions on firearm ownership and use," the report said. It said that twice in the run-up to the 2008 presidential election, "extremists appeared to be in the early planning stages of some threatening activity targeting the Democratic nominee, but law enforcement interceded." The report said that "lone wolves and small terrorist cells" represent the nation's biggest terrorist threat because their low profile makes it difficult to intervene before they act. Mark Potok, director of the Southern Poverty Law Center, which tracks extremist groups, agreed that Obama's election may have boosted membership in such groups, but called any link to the economy "more questionable." He said his group has documented "a steady, not dramatic," growth of extremist groups -- from 602 in 2000 to 926 in 2008, an increase of more than 50 percent. Though "there has been a lot of talk about the country being stolen," it is "a little early" to conclude that Obama's election has driven massive growth in such groups, he said. A DHS official said the department was not trying to squelch free speech by issuing the report. "There is no link between extremists being talked about in that report and conservative political thinkers, activists and voters," the official said. But conservative radio talk show host Roger Hedgecock was not persuaded. "If the Bush administration had done this to left-wing extremists, it would be all over the press as an obvious trampling of the First Amendment rights of folks and dissent," he told CNN. In fact, the Obama administration in January did issue a warning about left-wing extremists. Both reports were initiated during the administration of former President George W. Bush. CNN's Jeanne Meserve contributed to this story.